When the natal Moon is hooked into an aspect with one of the trans-generational planets (Uranus, Neptune and Pluto) it’s a signal that the individual’s needs are entwined with issues of an ancestral or cultural nature. The individual may feel as though s/he has something to bring to the world, or that s/he is carrying or fulfilling ancestral hopes. That’s quite a trip. And, for those born with the Moon in aspect to Neptune, that trip can be either woefully vague and drifty, or enchantingly beautiful. As always, perspective is everything. And perspective is wrapped up in the nature of the aspect. So let’s pull back the veil on the mists of Neptune and Moon to see what kind of potentials and tendencies are available. At first glance—regardless of the aspect that Moon and Neptune make—these two celestials have an affinity for each other. Each is endowed with highly subjective attributes: it can be difficult to look beyond one’s ‘reigning need’ (as represented by the Moon), just as one’s search for spiritual and creative fulfillment (as revealed by Neptune) is subject to individual experience. Both the Moon and Neptune rule waterways and water signs (Cancer and Pisces, respectively). Associated as it is with feelings and emotions, water—that element that reflects like a mirror when it is still, and churns energy when it is choppy—provides a fount of healing and intuition. Moon and Neptune are naturally attuned to the fourth and twelfth houses, respectively—home and healing and sanctuary. For some, the two are inter-changeable. It is also fair to acknowledge that Moon and Neptune “see” each other more easily via some geometric alignments than others. When two celestial bodies align with unimpeded visual access to each other, they can uplift one’s vibration and the way one expresses the planetary pairing. 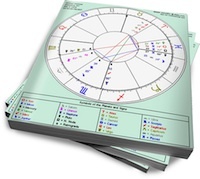 ›› Get a free copy of your natal chart — plus a short “planets in signs” report..
Not everyone born with a Moon-Neptune contact faces undue difficulty seeing things clearly. People with a natal sextile or trine between between Moon and Neptune have a natural aptitude for static-free transmitting and receiving. They possess intuition, empathy, healing ability, compassion, and creativity. And, in terms of whether or not they desire attention or privacy: it varies according to the situation. Sometimes it feels natural to be highly visible, and other times it feels better to be invisible. The point is, there’s no ongoing inner conflict about it for these folks; there’s just going with the flow (trine), and choosing for or against an opportunity (sextile). Would that life could always be so uncomplicated. Thank you for increasing my understanding of Moon relationships and knowledge of her friend Neptune.